Are you in the market for a musical instrument, a guitar perhaps? You have come to the right place. Guitar Center is home to easily the world's largest selection of popular guitars, basses, amplifiers, keyboards, workstations, drums, percussion, microphones, PA systems, DJ equipment, stage lighting, recording software, studio gear and more. With over 260 stores across the U.S., if you are in the U.S., GuitarCenter.com would provide you the fastest, easiest way to find all the gear you need in one place. 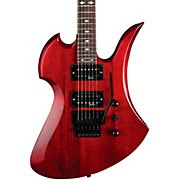 While many popular instruments are available for same-day pickup at a store near you, they also offer free shipping on thousands of items to the Guitar Center location of your choice. If you are in Malaysia, the good news is they do ship here. Better yet, you will see their catalogue with Ringgit prices so it eliminates the need for currency conversion. Their incredible buying power and strong relationships with all the top musical instrument brands allow for the availability of the best gear at the guaranteed lowest price. With their Low Price Guarantee, they will be glad to refund you the price difference within 45 days of your purchase. What are you waiting for? Go get your own guitar center card today! It is another hot day here in Kuala Lumpur. 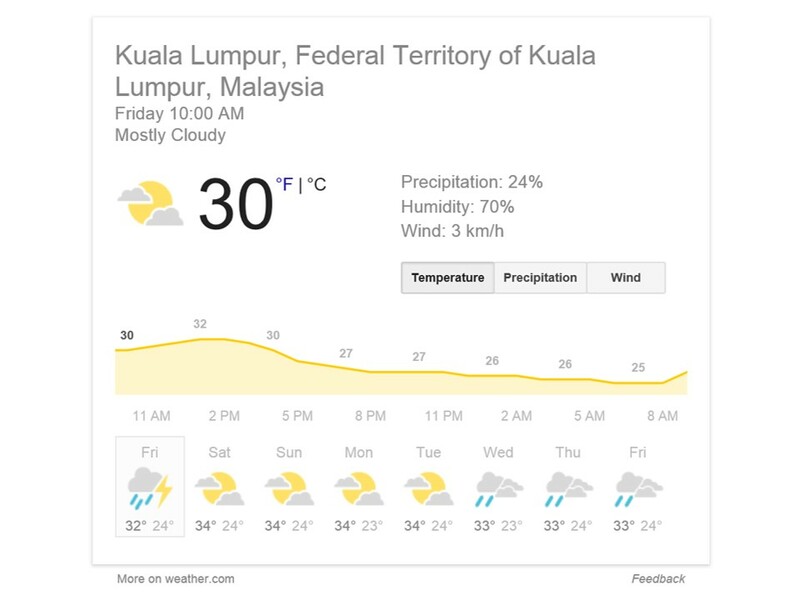 The weatherman at Google recorded a temperature of 30deg C or 86deg F as at 10 this morning. See, no bluffing, one! But then again, the weather is usually like this - so hot, and dry, and windy - during this time of the year, i.e, around Chinese New Year, which if you are counting is just nine days away. Hurray! If you find the heat quite unbearable, do like what many people do, go out to the mall - where the aircon is good and the shopping even gooder (read better). The heat is too much outside for you to venture out? Ok, never mind, stay in and see if this week's Personality Quiz would cool you down somewhat it being a Winter scene and all. 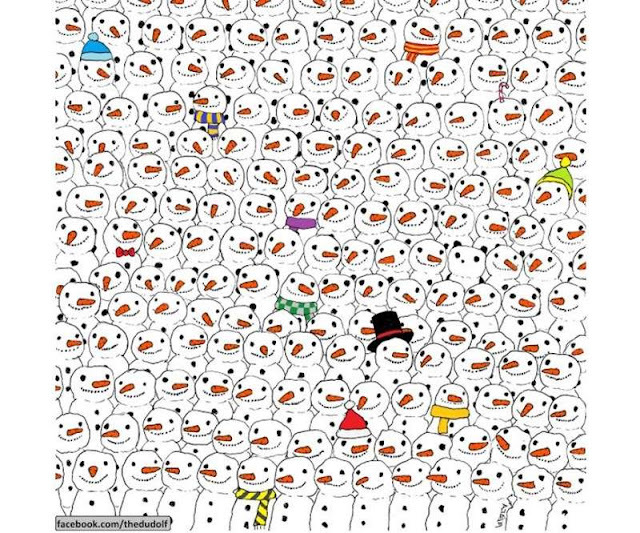 Here's a snow-field of our favourite character in Winter. But wait, there's an 'odd man' out there among them. See if you can spot him ('her' is nursing their new-born cub at the Zoo). 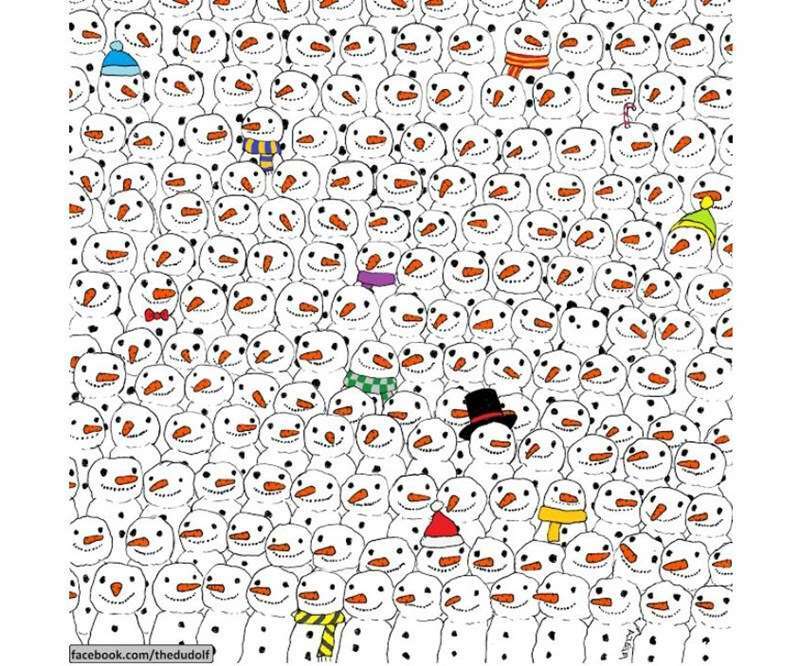 See if you can spot another black-and-white cutie among the snowmen He is Mr Panda. Ssshh, if you have already played this, don't spill the beans. Clue? Come back on Monday and I'll tell you. Happy looking! Well, whaddaya know, Chinese New Year is barely two weeks away. Not feeling the vibe yet? Easy! Take a trip downtown, the decoration and bustle of shoppers doing their Chinese New Year shopping will surely get you in the mood. Chinatown is a good place to go to for that Chinese New Year feel. 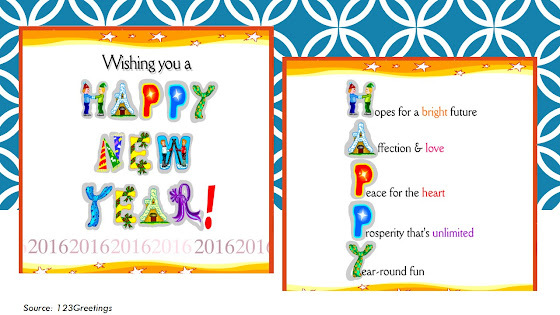 Chinese New Year this year falls on February 8, a Monday. It will be the Year of the Fire Monkey. The eve is the 29th day of the 12th lunar month, if you are interested. I read that the auspicious colour to wear is yellowish brown. But then again, red is the default colour for Chinese New Year, right down to inner wear. Want to start the year right? Below is a chart showing the best days or auspicious days to commence work in the new year. So you can start planning your leave now. 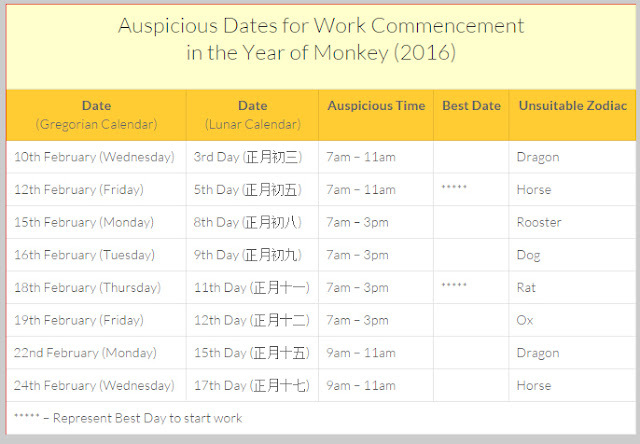 According to the guide, the best days will be the 5th day (12 Feb) and the 11th day (18 Feb) of the new year but if you are a Horse or a Rat person, pick another day. Also, take note of the auspicious time. Don't know which animal year you were born in? Not a problem, you can find out here on the Chinese Zodiac chart. Now you know. Go forth and prosper! If you are someone who finds joy in looking at the sky, you are in for a rare celestial treat. Malaysians, as well as with most parts of the world, are in for this treat as the five planets of Jupiter, Mars, Saturn, Venus and Mercury align in a rare astronomical event from last night until the end of February. This rare alignment will be visible simultaneously before dawn during this period. The best display of this phenomenon is expected to be on Jan 27 when the Moon comes into alignment with the five and Jupiter and Venus will shine the brightest. 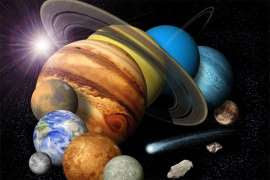 A senior lecturer at the National University of Singapore’s Department of Physics, Dr Cindy Ng told TODAY that four planets, with the exception of Mercury, had already been visible for several days. Mercury, she said, has just become visible, having moved far enough from the Sun. “Usually, we see the five planets in the night sky at different times of the night. It is thus a special event to observe all five planets in the night sky at one time,” she was quoted as saying. Those who wish to see this rare event can begin their watch just after 8pm tonight (12.50pm GMT). But wait, before you go out viewing tonight, here's this week's Personality Quiz, you've guessed it, related to the Planets. Find out What Planet Are You From? Interesting questionnaire too. Here's Last Friday's Quiz: How Do You View the Outside World? Yes, you can enjoy Kuala Lumpur on a budget but better yet here are 6 Things To Do In Kuala Lumpur almost for free as compiled by Michael Vincent Mislos of Compare Hero. Check them out! We’re all feeling the pinch with the rising cost of living (toll hikes, GST, you name it, we’ve felt it in 2015), but I’m a firm believer of staying positive and adapting to whatever situation that life throws at you! And that means there’s no need to stop having fun just because we have to be cautious with our spending. So if you’re on a budget like me, why don’t you check out these 6 things you can do in KL almost for free? This won’t cost you anything except for some old books and maybe the petrol to get you there. Simply drop by a book exchange to swap one book for another. The KL Book Exchange operates every first Sunday and they are located at the TM Point open parking in Taman Desa KL between 8:45am – 10:45am. They have an online book list where you can check out the books they have in stock so you can plan for which books that you’d like to swap for in advance! But I advise for you to get there early, especially if you have any specific books in mind. Or as an alternative, you can also reserve a specific book for collection via their Facebook page. Now if you’ve always wanted to be creative and make something with your own hands, why don’t you consider dropping by the Sewing Club Malaysia? They host sewing classes between Fridays to Sundays and the classes are free! There are sewing machines for you to use but you will have to bring your own materials, such as fabric, needles and scissors. And then you’re all set to learn how to make bags, cushion covers and more at their classes. Put it this way, picking up sewing craft as a hobby can also help you earn some extra pocket money! Enjoy the fresh air and green surrounding by walking high above the trees at the canopy walkway of the KL Forest Eco Park. Located right in the heart of Kuala Lumpur, this patch of rainforest is the oldest protected jungle in Malaysia and was formerly known as Bukit Nanas. Here’s a quick tip, make sure you pick up a map of the trails from the Forest Information Centre on Jalan Raja Chulan before you go. The KL Eco Forest park is open from 7:00am to 7:00pm. Immerse yourself in culture and art at the Islamic Arts Museum Malaysia. As South East Asia’s largest Islamic Arts Museum, come and be amazed by over seven thousand global Islamic artefacts! You can also get really hands-on here as they have cool workshops and arts & crafts lessons. Children will also enjoy the storytelling sessions. Admission costs only RM14 for adults and RM7 for students and senior citizens. The Museum is open Mondays to Sundays, 10:00am – 6:00pm. Have you always wondered what it would be like travelling around the streets of Kuala Lumpur without all of the notorious traffic jams and Malaysian drivers? Well, wonder no more! Because you can now wander around major roads of KL during the KL Car Free mornings. Everyone can cycle, jog, walk or even skateboard on the major streets of Kuala Lumpur on the first and third Sunday of each month, so be sure to mark your calendars! If cycling around the heart of Kuala Lumpur isn’t really your thing, perhaps you’d like to try cycling around Publika instead? Every Sunday, the roads at the mall are closed to cars to allow people to cycle, jog or skate in a safe environment. The event is called Wheelie Sundays and it’s another great activity for you to try out. Even if you don’t have a bicycle, you can even get free bicycle rides! You can also take part in the aerobics class organized at The Square. Interested? Make sure you’re up early on Sundays as Wheelie Sundays happen from 7:00am – 10:00am. So there you have it. With all these suggestions, there’s absolutely no reason you can’t have some fun even if you don’t want to spend too much money! If you’re looking for more money saving tips, check out the CompareHero.my blog. Friday Frolics - How Do You View the Outside World? Now, how do you view the outside world? Frankly, most of us don't care or have never really given it a thought, isn't it? This week's quiz will give you an inkling as to how you really see the outside world. Take this little thought-provoking questionnaire to find out your view. You don't like to speculate about the future. You prefer to live fully in the present. You don't get caught up in flights of fancy. You are down to earth. People are always more important than things. Things are replaceable; people are not. You are content to let people be who they are. You never try to change anyone. I learned something new the other day about tubas. 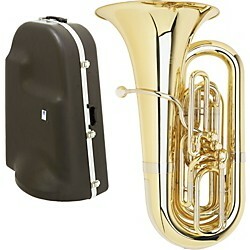 The image here is of a tuba. I guess you already knew that especially if you are into jazz music. The reason I say that is because tubas are consistently used in jazz music. There are different tubas available in the market for various types of performances for example, concert tubas are designed with the tubing wrapped so that the player can hold the tuba in his lap. Helicon tubas wrap around the body and are used for marching along with sousaphones, which are incidentally named after John Philip Sousa. On recording tubas, the bell points forward instead of upwards. These models were popularized in the early days of recorded music as they could more easily direct their sound to the recording instrument. The length of the tuba determines the fundamental pitch.